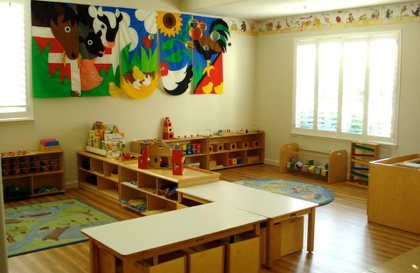 The Woodcreek Montessori School is based on the philosophies of Maria Montessori. 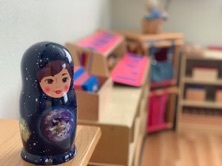 The Montessori Method focuses on allowing a child to learn in a hands-on environment, that is custom-made to each child’s individual educational needs. Every month, we focus on several different educational concepts to enhance the learning process, so that the children are exposed to a fine array of curriculum hand picked for them. Children work in the areas of Sensorial, Practical Life, Language, Mathematics, Science/Botany, Cultural Studies, Reading/Phonics, Music, and Gardening. Our classroom is split into two distinct areas; Older Infants/Young Toddlers & Older Toddlers/Preschool, so that both age groups can work on activities that are age-appropriate to their differing educational needs. Organic meals & snacks are provided for the children. We choose organically grown fresh fruits and vegetables for each meal, never canned or frozen. We choose BST-free dairy products, and nitrate free meats. We do not offer the children any food items that include high fructose corn syrup artificial sweeteners, red or blue dyes, or hydrogenated oils. We can accommodate special meal plans. Parents are able to enjoy the comfort of a safe In-Home School, with a separate classroom, in a small group setting. Our overall size is small compared with most childcare centers in the area. We offer flexible schedules for parents needs. We offer Morning Classes, Afternoon Classes, School Day Classes, and Before School Care. Wendy D. H. Spencer, is a Credentialed Montessori Teacher for Birth thru Three Years (through the National Center of Montessori Education, Sacramento, CA, 1996). She has been a Montessori teacher since 1996, and Director of her own Montessori School since July 1997. We are celebrating our 22nd School Year in Roseville, CA. Wendy D. H. Spencer, Owner/Director. Within the Montessori environment, the child feels empowered to develop. The materials within the classroom are chosen specifically for the developmental level of the child. Self-contained activities are placed on low shelves, so that the child can easily utilize them. A small rug is provided to define the child’s personal space; one in which they can feel independent of others in their selection of materials. All aspects of the environment are inspected to ensure safety and security of the child being able to fully explore the classroom environment. Our Outdoor Environment consists of age-appropriate Playground Equipment set on Recycled Tire Playground Tiles that can withstand a 6 ft fall without injury. The outdoors provide a year round environment, for the children to explore. We also provide large shade umbrellas to protect the children’s skin from harmful sunburns and skin cancer.